The Conflict Monitoring Center (CMC) is an Islamabad based independent research organization which focuses on anti-state and anti-government insurgencies and counter-militancy campaigns in South Asia, particularly Afghanistan, India and Pakistan. It incorporates its findings in monthly security reports and releases them to the press for general information as well as scholarly analysis. 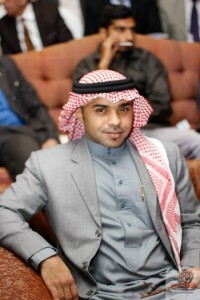 CMC prepares monthly reports based on data collected from mainstream national and international media organizations. out by anti-state or anti-government elements against security forces, government machinery, and civilian targets. These activities are further divided into assaults (including raids and ambushes), bomb blasts, suicide attacks, and target killings etc. The third or the other category includes drone attacks, cross border firing / shelling, mysterious killings, suicides etc. The data is processed for each country and province / region as well as attack-wise for each month. For analytical convenience and generalization, Afghanistanand Indiaare divided geographically into 4 and 5 parts (regions), respectively, i.e. eastern, northern, southern and western (and also northeastern for India). Pakistan is divided in to four provinces, besides, Islamabad Capital Territory (ICT), FATA, Northern Areas, and Azad Kashmir. 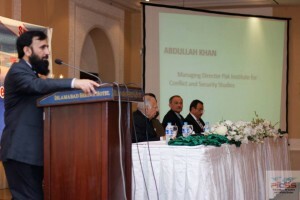 The political conflicts continued to breed violence in three main South Asian states, i.e.Afghanistan, India, and Pakistan taking as many as 1348 lives and leaving more than nine hundreds others injured in 353 different incidents during the month of September 2011. Afghanistan being controlled by the coalition forces remained the worst hit state by violence as more than one half of the total incidents of armed conflicts and about two thirds of the resultant deaths were reported in the country. At least 177 violent incidents took lives of 887 people and left 374 others injured inAfghanistan. 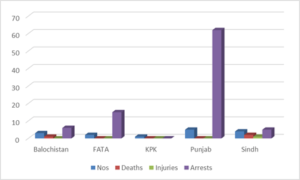 InPakistan, 113 incidents took lives of at least 397 people and inflicted injuries to more than 464 others. At least 64 people were killed and 113 others sustained injuries in 63 different incidents in India. About two-thirds of the victims of the armed conflicts in the entire region were alleged militants whereas civilians’ deaths constituted about 22.25 % of the total fatalities. At least 181 security personnel, forming 13 percent of the total casualties, also lost their lives during the reported month. Out of them 121 were killed inAfghanistan, 11 inIndiaand 49 inPakistan. The security forces actions took more lives than those killed in insurgencies in the region and most of their victims were the alleged militants. In all, security forces took 741 lives in 150 different incidents. Those killed in security forces actions included 685 alleged militants, 32 civilians and 24 security personnel. The highest security forces actions as well as resultant deaths including highest civilians’ casualties were reported inAfghanistan where 604 people, including 566 alleged militants and 30 civilians, were killed in 78 different incidents. On the other hand, the insurgents took lives of 585 people and left 730 others injured in 199 different incidents in the region.Afghanistan remained worst hit country by insurgency both in terms of total number of incidents as well as resultant deaths in a single state. The militants took 283 lives and left 278 others wounded in 99 different incidents inAfghanistan. 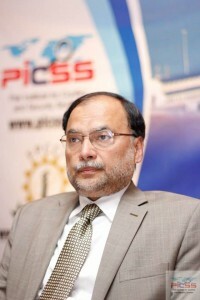 InPakistan, 262 people were killed and 346 others injured in 73 militants’ activities. InIndia, 27 militants’ activities took 40 lives and injured 106 others. The civilian deaths in insurgencies remained significantly high in the region constituting about 46 percent of the total deaths in militants’ activities. The highest civilians’ deaths in insurgency were reported inAfghanistan followed byPakistan, i.e. 122 and 110, respectively. InPakistan, the suicide attacks and bomb blasts mostly took lives of civilians. 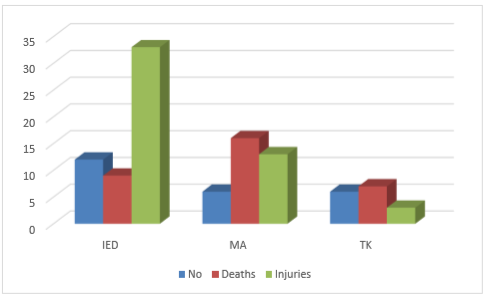 The lowest civilians’ deaths in security forces actions were also reported inPakistan. The eastern and southern regions inAfghanistan, eastern, northern, and northeastern region inIndia and FATA,Khyber PK and Baluchistan inPakistan are the worst hit areas by violence in the region. The American Central Intelligence Agency (CIA) continued its drone campaign to target suspected militants in FATA killing at least 22 people and leaving 9 others injured in 4 different attacks during the month. 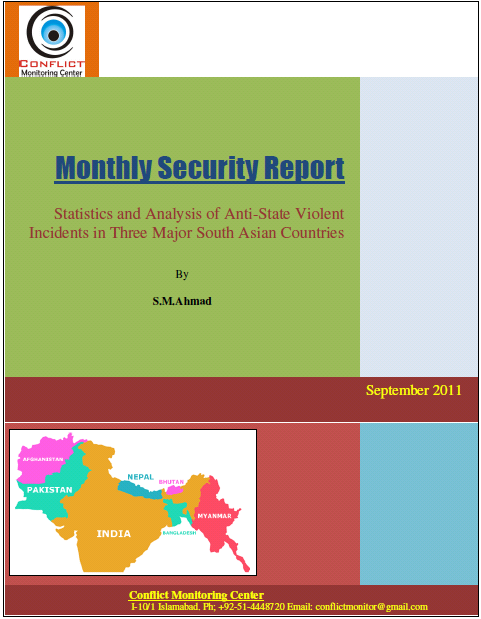 Everyday of September 2011 witnessed about 12 incidents of armed conflicts and 45 resultant killings in three South Asian states, i.e. Afghanistan, India, and Pakistan (in alphabetical order). In average, every fifth person killed in the region was a civilian whereas militants’ deaths remained highest among the total victims of anti-state and /or anti-government insurgencies and counter-militancy campaigns in the region. During last month, 612 militants were arrested in three major countries of South Asia. Majority of them (486) were arrested in Afghanistan while 43 militants in Pakistan and 83 in India were also nabbed during the period. The US premier spy agency, the Central Intelligence Agency (CIA), continued its cross-border militants-hunt-drone campaign during the month. It carried out 4 drone attacks and fired 9 missiles on 4 different days killing at least 22 suspected militants and injured 9 others during the month of September 2011. The anti-state and anti government insurgency took lives of at least 262 people and left 346 others wounded in some 73 incidents during September 2011. The militants’ casualties and civilians deaths remained almost equal in insurgency, which also took lives of 41 security personnel. American secret Central Intelligence Agency (CIA) has continued its drone campaign against suspected Al-Qaeda and Taliban militants in FATA. It carried out 4 drone attacks killing 22 alleged militants and inflicting injuries to 9 others during the last month. First 22 days of the month saw only one drone attack but due to a sudden increase in drone attacks, CIA carried out 7 drone attacks in last seven days of the week. September saw a remarkable reduction in drone attacks and subsequent killings. September 2010 was deadliest ever month since 2004 when 147 people were killed in 23 (highest ever number of) drone attacks. Conflict Monitoring Center also observes that CIA has lessened number of drone attacks in Pakistan since July. June was the deadliest month of current year when 117 people were killed in 12 drone attacks. July and August saw six drone attacks apiece. EASTERN INDIA: Bihar, Jharkhand, West Bengal, Orissa, and Chhattisgarh; NORTHERN INDIA: Jammu & Kashmir, Himachal Pradesh,Punjab, Haryana, Uttaranchal, Uttar Pradesh. Uttar Khand, and Madhya Pradesh; SOUTHERN INDIA: Andhra Pradesh, Karnataka, Tamil Nadu, and Kerala; WESTERN INDIA: Gujrat, Maharashtra, Goa, and Rajasthan; and NORTHEASTERN INDIA:Arunachal Pradesh,Assam, Nagaland, Manipur, Mizoram, Tripura, Meghalaya, andSikkim.